Can I customize the RSS feed template? 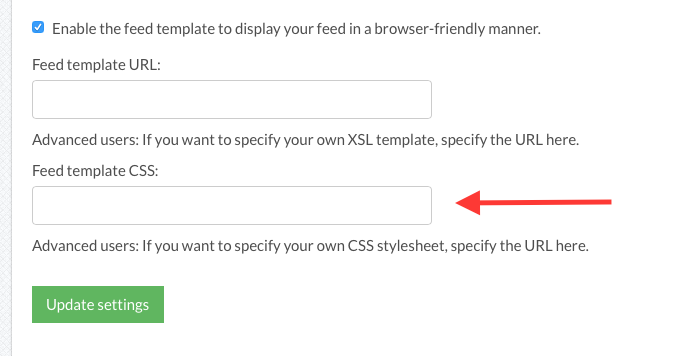 For developers interested in customizing the RSS feed template, you can do this by specifying a custom CSS file by going to Settings > Your Feed. Our XSL template uses other XSL templates, all bundled together. Note: Do not include our internal XSL files! Github is a good place to host your feed template, since you can commit and track changes to it conveniently. If you view the source code of your current feed, you'll see the template is linked within: http://feedpress.me/~files/feed-premium.xsl. Support policy: FeedPress does not provide coding assistance as this is intended for knowledgable developers. If however, you're confident everything is setup correctly, do feel free to let us know if you run into an issue that needs correction.